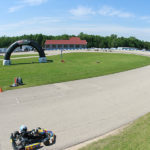 This weekend was the second straight trip for the United States Pro Kart Series to the US Air Motorsports Raceway in Shawano, Wisconsin. The facility was constructed in 2004, and has received rave reviews for the layout, making it a ‘driver’s track’ with the changing elevation, speed and roller-coaster style corners. 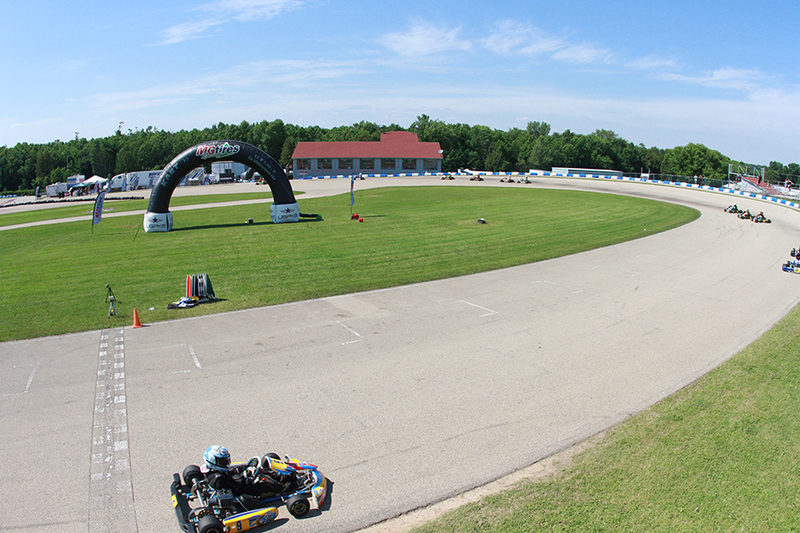 USPKS made its first trip last year, with a number of the series competitors never having seen the northern Wisconsin course. 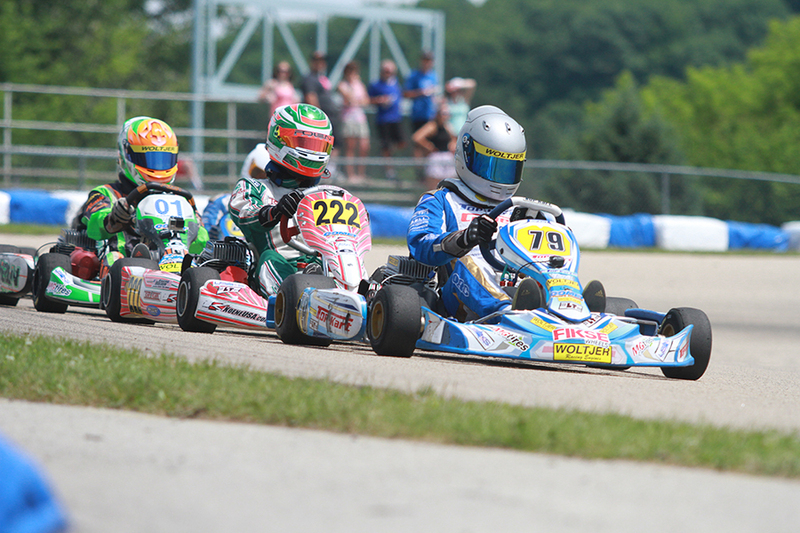 It welcomed near record numbers for both the USPKS and Route 66 Sprint Series. This year, numbers were not as high, with the USPKS total reaching 120 for each day. About an hour west of Green Bay and two hours from the outskirts of Milwaukee make it a long haul for those in the Eastern time zone. This weekend I had the distinct pleasure of meeting the designer of the race course – Kenny Venberg. The Minnesota-resident is a former Vice President of the World Karting Association and among the founders of the Northland Region Karting Association. Venberg designed the Stockholm Karting Center, Purdue Grand Prix and many other circuits in the United States. When designing the US Air Motorsports Raceway course, the only limit put on the layout was it had to be over 1-mile long. He used the landscape of the lot and incorporated a track around it, making it a true ‘bucket list’ type track to drive. The future of the US Air Motorsports Park is once again up in the air. Last year, an auction was held to sell the property and was originally thought to be sold for $345,000. An article published this February by the Shawano Leader stated no change in ownership was recorded at the county courthouse, and currently a $103,806 bill is owed by September 30 for property taxes and interest unpaid since 2012 by Green Mountain Finance Fund. 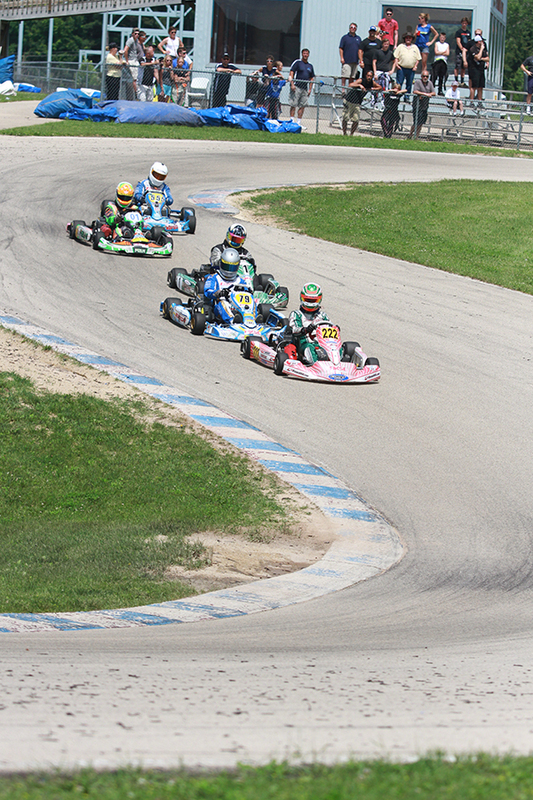 USPKS and Route 66 are not returning next year to help move around the different facilities that want to host an event, with the Briggs 206 Cup program the last karting event schedule in 2016 at the facility this September. Last year was a phenomenal performance by Brandon Lemke in the Junior categories, sweeping the two rounds in Shawano in both classes. Moving up to the Senior ranks against some of the toughest competition in the country, you would think a sweep was near impossible. Well, the Franklin Motorsports / Merlin driver nearly pulled it off in IAME Pro. Lemke was the top qualifier both days and won all four heat races. Saturday’s main event looked as if he had the win in hand until the kart went away at the end, and fellow Senior rookie Zach Holden drove his way to the victory. Lemke bounced back and was uncatchable in the Final Sunday, earning his second feature win of the season and extended the championship lead. The next day, Lemke traveled to North Carolina to have a try at a Legends car after having raced a dirt sprint car this winter. Holden notched his first USPKS win as a Senior driver Saturday. The Comet Kart Sales / Tony Kart driver was among the quickest all weekend, keeping pace with Lemke throughout the heat races to remain more consistent over the weekend, unlike the opener in New Castle. He ran down Lemke Saturday with consistent lap times, as tire management was a key factor all weekend with the Shawano surface hard on the MG Tires. Holden drove to a 1.3-second advantage for his first major Senior victory. Sunday, Holden ran second to Lemke and was in position to challenge once again in the main event. On lap five, Holden drove down the ‘wooded’ straight and went off-course at the end. He continued to get back on the course and would eventually pull off. The throttle housing caught on something somewhere from the last corner down to turn four while his foot was flat out on the pedal. 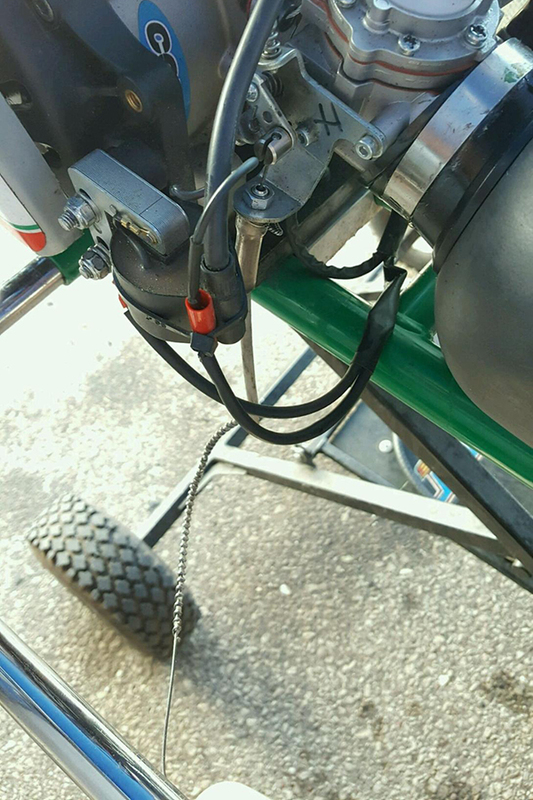 The housing and cable was completely ripped off from and locked the throttle at the carburetor wide open, ending his chance at a second victory and the IAME USA bonus for a double win weekend. 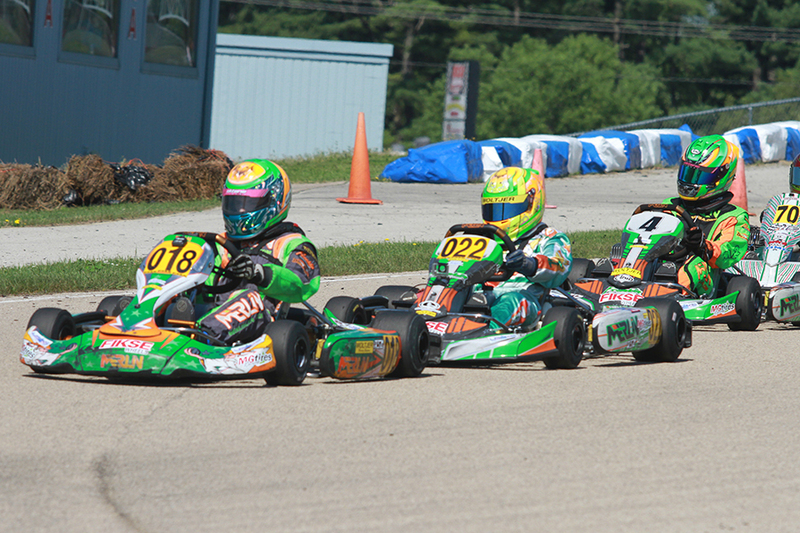 The last two seasons, Top Kart USA driver Dakota Pesek has been among the challengers for the Yamaha Pro championship. In 2014, he finished third and came up just short against Senior rookie Mike McAndrews a year ago. Pesek established himself as the driver to beat in the championship at the halfway point by sweeping the main events in Shawano for a second-straight $1,000 payday. The entire weekend was a game of chess with the front runners, including IAME Pro standouts Brandon Lemke and Zach Holden. Saturday, veteran Kevin Nelson (Tony Kart) was in the mix while Sunday brought in Minnesota driver Alexander Kardashian. Saturday, Pesek put himself at the point before the white flag, and avoided any challenge as the group made contact. The result sent Nelson off the track and allowed Pesek to cruise to the victory. Sunday was a much different scenario with Lemke at the point and Pesek in the lead challenger role. Lemke ran defensive line down the ‘wooded’ straight and Pesek chose to take the high line. Running on the cushion, Pesek was able to hold the outside, and beat Lemke to the exit point, putting him in position for the next corner – the right-hand turn six. It was a move we had not seen all weekend long, as Pesek continues to show why he is among the top Yamaha drivers in the country. The category has produced two great weekends of racing, with GoPro next month and Pittsburgh in September a high percentage that they will not disappoint. The state of Wisconsin is home to Merlin Nation. Franklin Motorsports is the importer of the Merlin chassis, with roughly over a decade of development for the brand specifically for the United States market. Last season was the year of Lemke in the Junior category and Merlin, winning 14 of the 16 main events. Lemke swept the weekend in Shawano, never losing an on-track session a year ago. This time around Merlin took the main event victories in three of the four races. Alex Bertagnoli has become the new leader in the Junior ranks for Merlin Nation and took both wins in the IAME Junior category. The weekend began as a break-out for Georgia driver Myles Rowe (Tony Kart), posting fast time in qualifying and winning the two heat races. Bertagnoli was able to steal the lead early and drove to the victory. Sunday was a battle to the end with the field bunched up. Alex was be the best in three of the four sessions, more importantly in the main event for his third of the season. 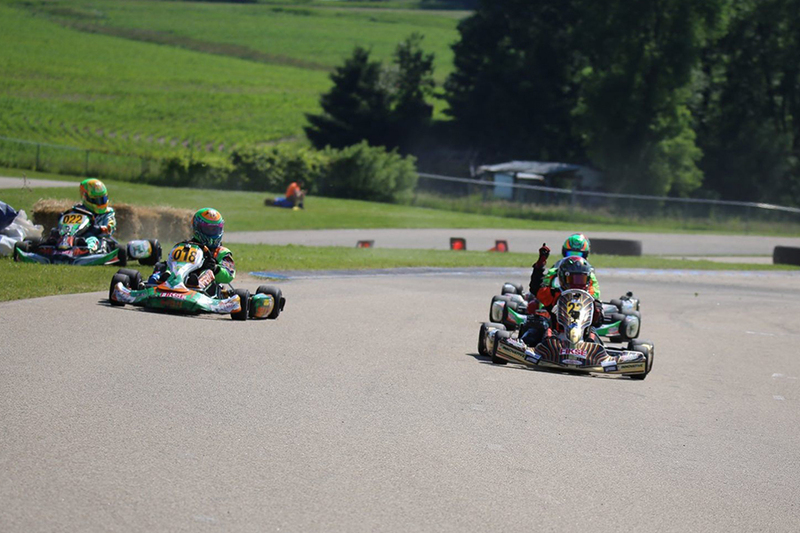 Former USPKS Cadet champion Sam Mayer is halfway through his first Junior season, earning a victory in IAME last month at New Castle and added his first in Yamaha in Shawano. Mayer was among the quickest all weekend, securing fast time Saturday along with a heat win before running away with the victory in the main event. Sunday saw Mayer take both heat races away from top qualifier Zack Pretorius (FA Kart). Sam was trailed by a group of four, including Merlin teammate Austin Schaff looking for his first Junior victory at USPKS. The two swapped the top position a number of times, including the final lap. The two made contact coming to the checkered flag, allowing Matthew Northrop to slide through and steal the victory and kept Merlin from scoring all four Junior victories. Northrop’s story is another unique one, as the Innovative Performance / Tony Kart driver made it a one and done trip. The Sugar Grove, Illinois resident doubled up in the win category during the Route 66 Sprint Series weekend, electing to not compete during the USPKS program. By the beginning of the weekend, he and his father elected to make the four-hour drive Saturday night to compete for just the Sunday round. Thanks to the series allowing new tires for all divisions utilizing the MG Yellow compound, there was no issue with him competing for just Sunday. Northrop put himself in contention throughout the day, and drove his way to the third spot after dropping to 10th on the opening lap with fast laps of the race. The top two collision opened the door for him to grab his first USPKS checkered flag. The younger categories have a select few that are showing the way after four rounds of racing. Benik driver Reece Gold established himself as the top driver in the IAME Cadet division, leading six of the eight on-track sessions in Shawano. The Florida driver still trails his Benik teammate Tyler Maxson in the championship standings. Top Kart USA pilot Kaden Wharff has four straight wins in the Yamaha Cadet division following a weekend sweep in Shawano. Wharff has been nearly unstoppable in the Yamaha-powered machine, nearly sweeping the Route 66 weekend as well. Brent Crews has the same record in the IAME Rookie, not leading at the end of just two sessions all season. The Energy driver had his perfect weekend broken up with a 720-spin coming out of turn four, managing to continue on and finish the race. Crews has four wins on the season, holding a sizable lead in the championship chase. The Yamaha Rookie divisions had Paige Crawford with the advantage in New Castle, while Elliot Cox showed the way in Shawano. The two have split the wins on the season in the Yamaha Rookie category as Cox (Benik) was one session away from sweeping the Shawano weekend. His performance has helped to narrow the championship chase to just 10 points between he and Crawford heading to Mooresville.